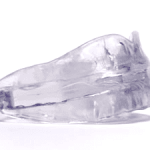 View my list of top stop snoring mouthpieces after five years of market research and personally trying each of these devices. 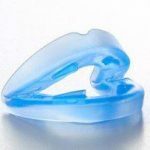 While I do not think there is necessarily one best snoring mouth guard, there is definitely one best snoring mouthpiece for you. And when you find the right one, yes, it actually can feel pretty comfortable (though finding the wrong one is torture). In these snoring mouthpiece reviews I’ll talk about the features, but also my personal experience. Your experience may end up being slightly different than mine, but most people tend to notice the same things with each mouthpiece, whether it’s bulky, hard to breathe, hard to clean, too expensive, not effective, etc. Deciding between which mouthpiece guard really comes down to your personal preferences. Note: I participate in affiliate programs, where we are compensated for items purchased through links from our site (at no cost to the buyer). See our disclosure page for our list of affiliate programs. See below my recently reviewed snoring mouthpieces, favorites on the top. If you can’t stand guards or snoring products that require something in your mouth, this company has been in business over 15 years. When I first was first deciding which anti-snoring device to try, I was overwhelmed. I knew there were products available, and was even familiar with some brands, but I was not prepared to choose from such a huge selection. How are you supposed to know which features will work for you? 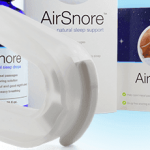 After trying a TON, I realized there is no guaranteed way to select your ideal stop snoring product. A device some people you know swear by may not work for you. Alternately, a mouthpiece that a friend or relative had no luck with could be your perfect option. Sometimes, you get lucky, and are completely satisfied with the first one you try. However, there is also a chance that you will need to go through a bit of a trial-and-error phase. Fortunately, you will find that many products have a money back guarantee, so you can put them to the test and have peace-of-mind knowing they can be sent back in a specified amount of time for a refund. This site reflects my experience with each mouthpiece, so use my reviews as a data point, but know that your preferences may be entirely different. Below are the ratings for more (less popular) mouthpieces and stop snoring devices I have reviewed. Some think that if they don’t have a significant other, they really do not have a reason to stop snoring. No one is complaining, so why bother? Perhaps you both snore, and have ongoing jokes about who reaches the loudest decibel. Unfortunately, this is not a laughing matter. Snoring is not just an obnoxious noise, and it doesn’t matter if there is no one around to complain; it’s bad for your health. Snoring deprives your body of oxygen. It stops you from reaching, or staying in, a deeper sleep stage, which leaves you tired and affects your present- and long-term health. So, if you need to stop snoring, keep reading below. Or, head straight to my how to stop snoring info graphic and video that quickly helps determine which type of snoring solution may work best for you. 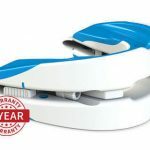 There are a lot of products on the market, from nasal strips to snore pillows to chin straps (although My Snoring Solution is a great product), but anti-snoring oral devices are consistently rated as one of the most effective solutions to use to stop snoring. Now, if you have never worn a mouthpiece, or if you are having flashbacks of those horribly uncomfortable ones you wore when you wrestled or played hockey when you were young, rest-assured that there are some very comfortable anti-snoring mouthpieces on the market. After your mouth gets used to having a foreign object in it, you will likely not even notice it anymore. You may also be assuming that one of these oral appliances is going to put a huge dent in your pocketbook, but it won’t. Most are surprised to discover just how affordable they actually are. The first step to putting a stop to your snoring is deciding on a product, which is where this guide will come in handy. Tongue retaining devices (TRDs), also known as tongue stabilizing devices (TSDs), differ greatly from the typical mouthpiece design because they are not mouthpieces at all. These products are often referred to as mouthpieces to keep things easy, but they do not actually go in your mouth. A TRD works by holding your tongue forward while you sleep. If it can’t collapse back into your throat it won’t cause a partial obstruction. Plus, it reduces the chance that soft tissues get close enough to one another to cause the vibration that makes the snoring sound. Right about now, you may be trying to imagine how something can hold your tongue forward. You are probably also cringing at the thought of it. After all, your tongue plays a pretty important role in talking and eating. Rest-assured, TRDs do not cause the pain you are imagining. If they did, no one would want to wear them, especially not me, and considering Good Morning Snore Solution, a popular TRD, is one of our recommended products, this should put your mind at ease. A TRD looks a lot like a pacifier. You will see a bulb on one side and a suction cup on the other. When you squeeze the bulb and touch the other end to your tongue it creates a suction to hold your tongue forward. The rest of the device rests between your outer gums and inner lips. It doesn’t matter how much you move around during the night or even if you open your mouth to talk in your sleep; a TRD is not going to just fall out of your mouth because it is actually attached to something. Most people agree that TRDs are quite comfortable. They are made from a soft and smooth medical-grade material, so there is no irritation to your gums, lips, or tongue. However, like any anti-snoring devices, you will need to get used to wearing it. Your tongue may feel sore the first few days, but that’s mostly from being engaged in an active position all night, not so much from the suction. Like any other muscle on your body, your tongue has to get used to working more than usual. How Effective is a TRD? When you review TRDs, you will find that they are reported as being at least 80 percent effective. Some products are rated even higher. It is hard to believe such a simple design can be so effective at treating such a large problem, but in many cases it is. Add the fact that you can buy a TRD, such as GMSS that’s also affordable and comfortable, and it is easy to understand why a product, such as this, is so popular. Who is a TRD Not Right For? 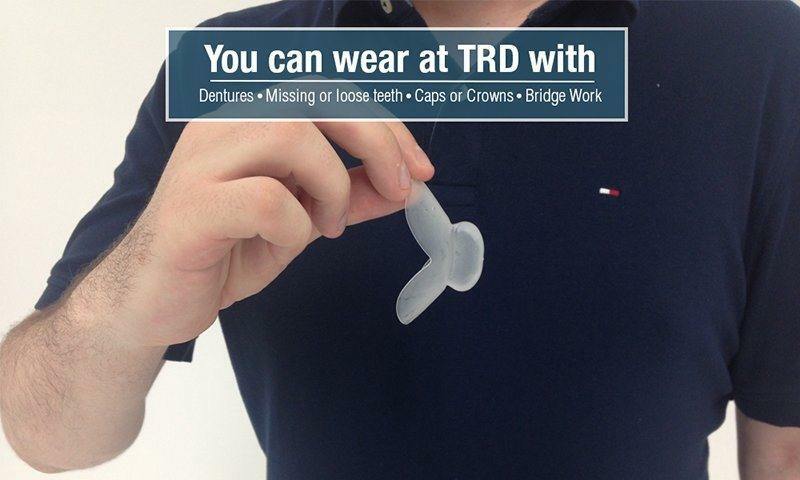 One of the most attractive things about TRDs is that since they don’t go in your mouth and you don’t have to bite down on anything these devices are suitable for people with dentures, missing or loose teeth, crowns, caps, and bridgework. However, due to their design, you need to be able to breathe through your nose to wear one. 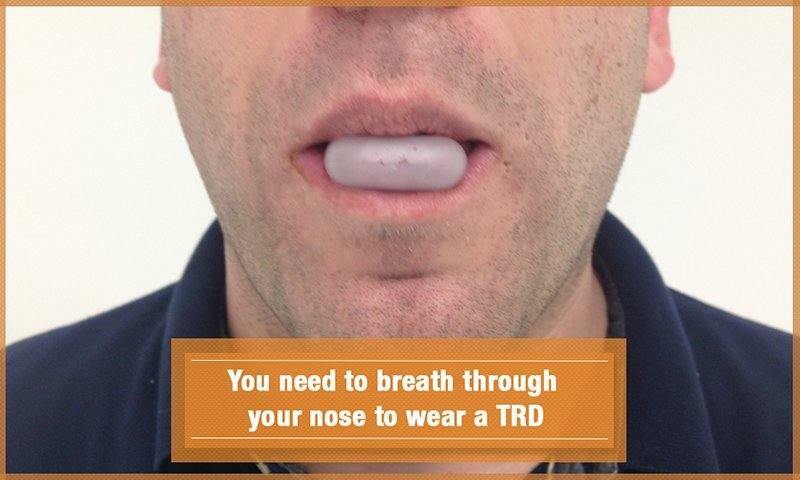 So, if you have a deviated septum, nasal polyps, or sinus problems, a TRD would not be the best choice for you. Also, if you have severe allergies like I do in the spring, you may want to have a traditional mouthpiece with airflow ports to use as a backup while your nasal passages are stuffy. 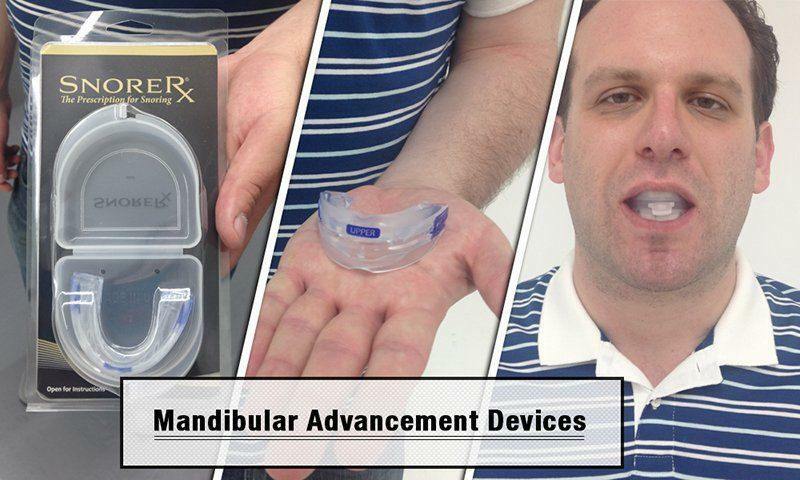 Mandibular advancement devices (MADs) are the oral appliances most people are familiar with because they actually look like traditional mouthpieces and mouth guards. Don’t worry; these products are nothing like those uncomfortable sports mouth guards or mouthpieces you are thinking of. They are available with a wide variety of features. Some are more streamlined than others while certain ones allow for a more tailored fit. MADs work by holding your jaw in a forward position. The goal of keeping the airway clear is the same as with the TRD, but the two products take different approaches. An MAD does not hold your tongue forward (except Zyppah, which is a hybrid product), but since it holds your jaw there is less chance of your tongue collapsing back enough to cause an obstruction or allow tissues to vibrate. Go ahead and extend your lower jaw forward and then try to force your tongue back towards your throat. It is not very easy, right? Chances are good your tongue naturally wants to stay forward with your jaw. This is how MADs work. Every person is going to have a unique MAD that just feels comfortable to them. For me, it’s the SnoreRx mouth guard because I love the flexible design, but you may prefer a product that is stiff. It’s all about personal preference. Comfort needs to play a big role in your decision because if you are uncomfortable, you are going to have a hard time falling asleep, and then it will end up collecting dust in the drawer of your nightstand. Many feel that the more adjustable a mouthpiece is the more comfortable it will be, but this may not be the case for you. Either way, you will need to give your mouth time to get used to the device, and that is rarely going to happen overnight. 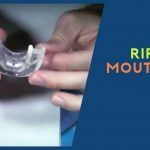 In most cases, the snoring mouth guards that require a boil-and-bite or dental impression fitting process are going to be the most comfortable and effective. However, there are exceptions where a product that is ready-to-go out-of-the-box is both effective and comfortable. This is the case with ZQuiet, which requires no fitting process, but allows you to trim and file, if it’s too big. Don’t let the boil-and-bite process intimidate you; it is a lot easier than most imagine. Always read the instructions for specific details when you are ready to fit your mouthpiece, but in general, you heat the product in boiling water to make the material pliable. Then, you will bite into it to make an impression with your teeth. Upon removing it from your mouth, you will put it in ice water to speed up the hardening process. In some cases, you will need to bite into the tray with your lower jaw extended forward. Others allow you to just bite normally because they have adjustment features that allow you to tweak the position of the lower jaw. You can usually reheat a mouthpiece an average of three times before you compromise the material, so don’t panic if you don’t get the fit right the first time around. Of course, there are exceptions. PureSleep is a good example. You can redo the boil-and-bite technique, but you can only pick the lower jaw advancement setting once because the two separate pieces mold together. This is why it is so important to read through the product manual. Some devices actually send you a dental impression kit. You bite into this, ship it back, and your mouthpiece is custom made in a lab. These do generally offer a great fit, but you have to wait a little longer to receive your final product. As far as adjustability goes, all products are unique in this characteristic. As mentioned, some require you to bite down and create an impression with your jaw extended forward. In this case there is nothing more that needs to be done. 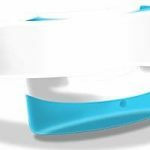 You will find some products use bands or special tools to adjust the lower jaw position. There are also some very customizable ones, such as SnoreRx, which allows incremental adjustments up to 6 millimeters. Do keep in mind that the snoring mouth guards with adjustability features take more of an effort to clean, but many find them to be the most comfortable. Material should play a larger role in your decision than you might expect. First, it has to be a safe medical-grade material. It is going to be in your mouth for several hours every night, so you don’t want some chemical-laden cheap plastic that can damage your health. Second, it needs to be nonirritating. The material should be smooth. Even the smallest rough seam or edge can cause a lot of pain, if it’s rubbing against the same spot on your gum or tongue every night. 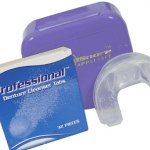 You would probably assume that all mouthpiece and snoring mouth guard manufacturers would use thermoplastic or a similar medical grade material, but this is not always the case. The main thing you want to avoid is BPA, which is an acronym for bisphenol A. There is a good chance you have heard about the controversies revolving this product. BPA was once commonly used in everything from baby bottles to plastic food storage containers. Through testing and case studies it was found that this element in polycarbonate plastic is extremely dangerous. BPA mimics estrogen. If you wore a mouthpiece made of a material containing BPA it would get into your bloodstream. You may be thinking that is pretty farfetched, but it’s not. You may be interested to know that BPA is present in a lot of cashier receipt paper. Well, BPA seeps into the skin and enters the blood so fast that it is detectable within four minutes of holding a receipt. Now, just imagine if that was in your mouth all night. Wondering if BPA is really something you need to be concerned about? It has been linked to cancer, diabetes, liver abnormalities, erectile dysfunction, heart disease, and fetal brain and hormone development. You may also want to make sure the device you choose is latex-free, unless you are 100 percent certain that you don’t have a latex allergy. When in doubt, pick one without. Roughly 3 million people in America are allergic to latex, and this number does not account for the countless people who have no idea if they are allergic, or not. Some MADs have airflow holes. This feature really only needs to be a deal breaker, if you know for sure that you need them. For example, if you have a deviated septum or chronic sinus issues that force you to breathe through your mouth instead of your nose; you want a product with breathing holes. These holes are made to ensure your body receives the oxygen it needs. Some devices have one while others have multiple holes. You don’t necessarily want the mouthpiece with the largest holes because this generally dictates a bulky design to accommodate the hole size, which is less comfortable. On the other hand, they can’t be so small that you can barely force air through even while you’re awake. Similar to the TRD leaving your tongue sore for a few days, you can expect an MAD to cause jaw soreness. Your jaw needs to get used to being in that position. In most cases the soreness fades away by the fourth day. Now, there is a huge difference between soreness and pain. You should not be in horrific pain. This does not mean an MAD is not for you though. You may find one product just leaves you too sore, but try a different style and barely experience any soreness at all. You should also be prepared to drool. Nearly everyone drools at first. No, you are not going to turn into the drool monster and wake up with your face in a puddle every night. Your mouth just has to get used to having something there. Have you ever popped a jawbreaker in your mouth and immediately started drooling? This is basically the same thing. It does not matter if you are new to learning about stop snoring devices or if you have tried a couple, but haven’t found your perfect match, you probably have questions. Here are the answers to some of the questions most commonly asked. There are a lot of factors that can contribute to snoring, such as hormones, alcohol, obesity, prescription medication, and the list goes on. However, the actual act of snoring is taking place because a partial obstruction is occurring in your airway. 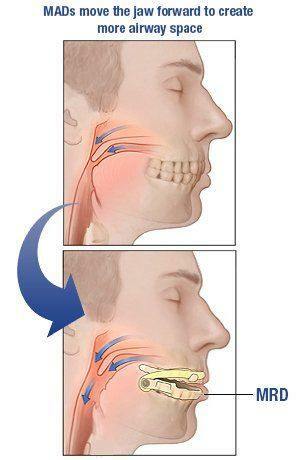 When you fall asleep, all the muscles in your body relax, which includes your mouth. Your tongue collapses back towards your throat. Not only is there an obstruction; your soft palate and uvula are close enough to vibrate against soft throat tissues. The vibration is what’s causing the sound. Is an MAD or TRD better? One is not better than the other. They both can be very comfortable and effective, but not every product is ideal for every snorer. The goal of TRDs and MADs is to keep the airway clear while you sleep. They simply use two different approaches to accomplish the same goal. Are oral appliances painful to wear? No snoring mouth guard or any snoring device should ever cause you pain, but both TRDs and MADs may cause soreness. An MAD may leave your jaw sore. Some find it soothing to massage the jaw right after removing the mouthpiece in the morning to relax it. A TRD might give you a sore tongue for a few days. It is important to note that sometimes, soreness from a TRD is because of too strong of suction. Try loosening this a bit. How do I know an oral appliance is safe? If you see a product has been cleared by the United States Food and Drug Administration, you can have peace-of-mind knowing it has been tested for safety. To ensure a product’s safety, always read the instructions, use it only as intended, and make sure you don’t have any pre-existing conditions that could be adversely affected by using the device. For example, if you have loose or weak teeth, you need to make sure the product you choose does not advise against wearing it. Can I wear a mouthpiece with dentures? 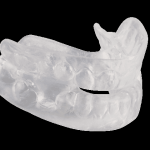 Although some MADs (snoring mouth guards & mouthpieces) say they are suitable to wear with dentures, they rarely are the preferred option. Since you have something in your mouth, you need to bite on; you would have to wear your dentures all night. Denture wearers tend to prefer TRDs. They suction to your tongue and the base sits between your inner lips and outer gums, so you don’t need any teeth at all to use one. Is there a snoring mouthpiece I can wear with crowns, caps, or bridgework? Select MADs state the product can be worn with crowns, caps, and bridgework providing the dental work is more than a specified number of months old. However, like having dentures, TRDs are generally the preferred option by individuals with these dental alterations. Can I use a mouthpiece for my sleep apnea? When referring to mouthpieces, sleep apnea is a really touchy subject. Only a medical care provider can diagnose sleep apnea and therefore, only a professional should be recommending a product to use. 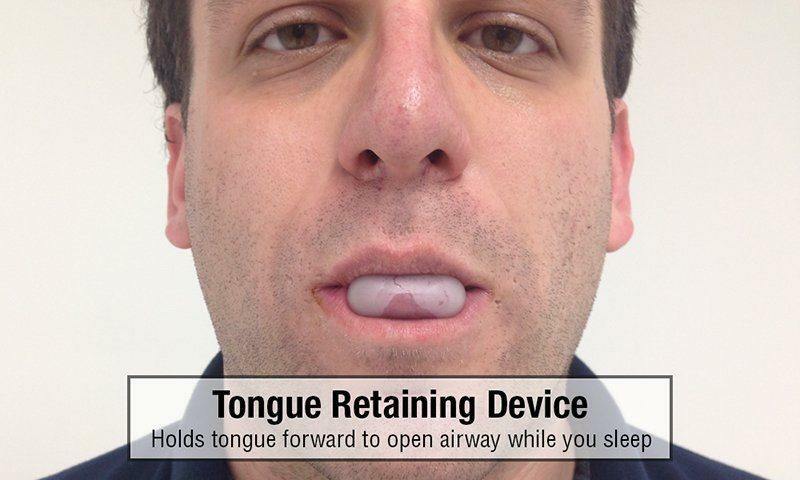 Some mouthpiece manufacturers state that their product can be effective at treating obstructive sleep apnea, but using one without knowing for certain if this is the type of sleep apnea you have could be very dangerous. Obstructive sleep apnea (OSA) is associated with an obstruction in the airway. Central sleep apnea (CSA) occurs when the brain doesn’t provide proper signals to tell you to breathe. If I have bruxism can I wear a mouthpiece? Bruxism, more commonly known as teeth grinding, often goes hand-in-hand with snoring, so if you do both, you are certainly not alone. You will also be thrilled to learn that in many cases, a mandibular advancement device can address both issues. Your MAD might have a shorter lifespan, but it is a small price to pay for saving your teeth, enjoying better quality sleep, and improving your health. 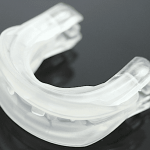 There are many snoring mouth guards and night guards that can eliminate bruxism. What is the life expectancy of anti-snoring devices? On average, oral appliances last between 6 and 18 months. Obviously, this is a huge variation, but that’s because there are a number of factors impacting that number. As mentioned, teeth grinding will wear out a mouthpiece sooner. Your sleeping habits and the quality of the device play roles, too. So, one said to last around 12 months could wear out sooner or last considerably longer. 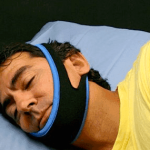 Can I wear a stop snoring appliance, if I’m a mouth breather? Yes! There are plenty of MADs that have airflow ports for this very reason. They are designed to ensure your body receives adequate oxygen all night, even if you can’t breathe through your nose. Do mouthpieces pose a choking hazard? Choosing a product cleared by a government regulatory service, such as the FDA, practically eliminates the risk for a choking hazard. This doesn’t mean there is a guarantee though. As we have seen in the past, sometimes even toys, car seats, etc. for children get approved and later get recalled for potential concerns. That being said, there is little to worry about, if you stick with an FDA-cleared product. Can I order a device for my child? Anti-snoring devices are never recommended for children unless prescribed by a physician or sleep specialist. A child’s mouth is constantly developing, which would be hindered by wearing a mouthpiece for several hours every night. Will a mouthpiece worsen TMJ? Most MAD manufacturers strongly suggest to not wear their product with temporomandibular joint disorder (TMJ). There are many causes of TMJ, including grinding and clenching teeth, dislocation, misaligned bite, arthritis, and cartilage wear and tear. Since wearing a mouthpiece affects the positioning of your mouth, which is ultimately dictated by this joint then wearing an oral device can worsen symptoms. If you have explored mouthpieces online and even read reviews you have probably seen the term “boil-and-bite” mentioned a lot. This is simply a fitting process used to help you get the best fit possible. The boil-and-bite method is not as challenging as you might expect. It simply involves heating the device, biting in the softened material to make an impression with your teeth, and then cooling it in cold water to harden. This process can generally be done a few times before the material is affected. The mouth harbors a lot of bacteria so the importance of cleaning your device every time you wear it cannot be stressed enough. Some recommend using toothpaste and a toothbrush, while others state you can just use dish soap. The one you choose may recommend using an effervescent product weekly for a deep cleaning. Some manufacturers even sell their own line of effervescent cleaning tablets. Can I order without a prescription? 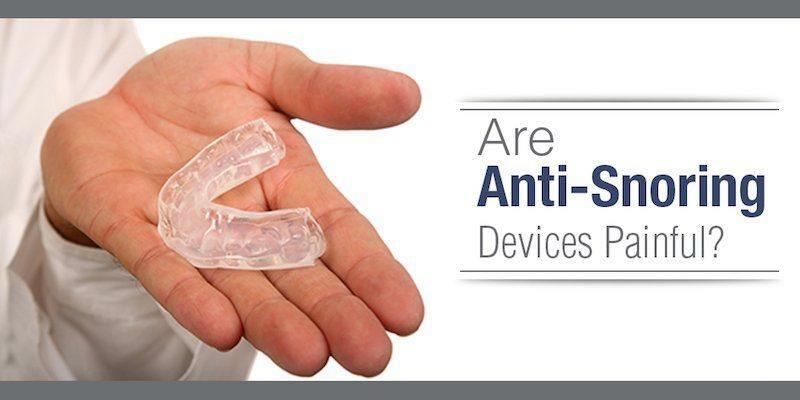 Anti-snoring mouthpieces are titled as a Class II Medical Device, which technically requires a prescription. There is a way around this thanks to the clause in the Code of Federal Regulations that states the device simply needs adequate directions, not a prescription. The products listed on this site can be ordered online from a secure site without a prescription in the United States. If I don’t need a prescription, why is the manufacturer requesting that I fill out a questionnaire? Manufacturers are looking for certain answers that could signify their product is not the best match for you. So, if you are asked if you wear dentures and you reply that you do, you may be told that this is not the product for you. How much are anti snoring mouthpieces? Oral appliances such as snoring mouth guards and mouthpieces can begin as low as $30 and sell for as much as $200. On the higher end, this may seem pretty steep, but considering one ordered with a prescription through a dentist can cost thousands, the ones on this site really have a fair price. Price should not make your decision though. Some assume the most expensive device is the best one. This is not necessarily true. Remember that every mouthpiece will fit everyone differently, so the most expensive one may not be comfortable to you. Can I just order one off eBay? eBay is known for having some fantastic deals, so it is no surprise that you can find dirt cheap ones. Unfortunately, if you really look at these products they are made with materials that have not been approved. Not to mention the design and effectiveness haven’t been cleared by the FDA either. Having something in your mouth is a really big deal. Make sure it is a product you can confidently trust. Nothing can compare to finding an anti snoring device that works for you. That first morning you wake up feeling fully rested and full of energy will tell you why so many snorers are using snoring mouth guards, MADs and TRDs. This is a big decision though. Take the time to compare products and their features, read each of our reviews, and select the one you think will best suit you. Don’t forget that it could take a few devices to find one that works for you, but when you do it will be well worth the effort.